The following guest blog is from our friend Alex Paman, an avid griller and aspiring cookbook author who is currently working on a book on iconic dishes of the Philippines. The above photo is courtesy of his fiance, Aira Baning. Below are three of my own satay tips. The word “satay,” used to describe meats skewered on bamboo sticks, is a regional term that is specific to Singapore, Malaysia, and Indonesia. That term is generally not used in the Philippines, however, where skewered proteins are known by other names. The exception to this is on the island of Mindanao in the Southern Philippines, which is culturally closer to Malaysia. 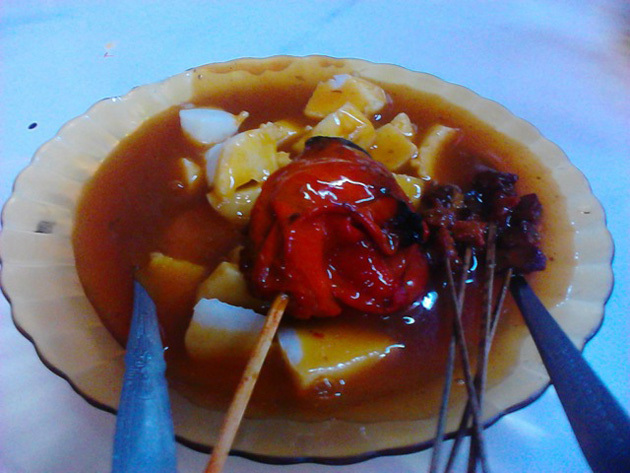 Satti, found in the city of Zamboanga, is a dish that consists of skewered chicken and beef—that sits in a bowl of spicy sauce filled with clumps of rice cooked in palm leaf pouches. Recipes are well-kept family secrets and are passed down from generation to generation. Satti is only available in restaurants from the region of the archipelago, but may eventually find its way to Manila in the near future. Make a grill shield: Fold a 12 by 18 inch piece of aluminum foil into thirds like a business letter, and slip it under the exposed ends of the skewers to keep them from burning. Use an improvised brush made of fresh lemongrass to baste the satays as they cook. Serve a flavorful Asian-inspired dipping sauce alongside the grilled satay, such as the Creamy Asian Peanut Sauce on page 18 of my book Planet Barbecue.